19m for Midlands' green car industry | What Car? The Government has pledged 19m towards the development of low-carbon vehicles in the Midlands, which is being designated a new Low Carbon Economic Area (LCEA). 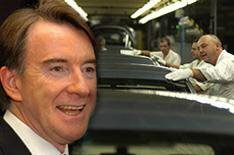 Business Secretary Peter Mandelson said the money would help to secure 10,000 jobs by transforming them into the 'green car jobs of the future'. He said: 'I want to see the Midlands help the UK to lead the global automotive industry in the transition from conventional to low-carbon vehicle technologies. will be invested in the Low Carbon Vehicles Technology (LCVT) programme, which will champion the development of green technologies from batteries to aerodynamics.